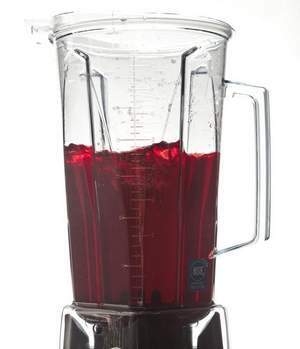 A friend asked for my opinion about a link to a story on the AP about a ‘new’ way to hyperdecant wine: using the blender. I want to share it with JvB UnCorked’s readers and see what others think about this. This story went out on the AP on Aug 7, 2013, from W. Wayt Gibbs, the editor-in-chief of The Cooking Labs. I have copied the text at the bottom of this post, with a direct link for your review, as well as an article I found that preceded it by two years about hyperdecanting, and a related YouTube video, all for your review. Short version: The Cooking Labs share their double-blind date that hyper-decanting, or aeration using a blender, will provide significant improvement in aeration over standard decanting. “Assuming the double blind test was done accurately and the results are also true, then any man of science should consider this type of aeration to be a good idea. The problem is that wine lovers have personal tenets and concepts about wine that are closer to religion than science in some ways. We’ve been taught that bottles and wines are to be carefully treated, like a baby -any rough handling is considered dangerous. I absolutely know that with some wines, the aeration will obviously make a major improvement. Yet, I have also experienced that some older wines have a smaller (shorter) window in which their aeration provides great improvement before they rapidly decline to undrinkable, and I wonder if this form of aeration could allow the wine to demonstrates its maximum potential right away, while I wonder and worry that after such treatment, if an old, delicate wine would quickly lose the flavor profile during a meal or course, which would be quite sad, if not catastrophic in an oenophile’s point of view. After sending my response to Scott, I pondered this idea for some time, about what how this might work well, under what circumstances, it could be useful or disastrous, and what bottles of wine in my cellar I might actually hyperdecant. I am quite curious at the idea, yet quite terrified by the concept, needing time to let the idea fully grow on me. I’m also horrified of the idea of the frothy foam created from a wine frappe, though some brilliant, Grant Achatz-like master chef would find a great way to implement 1982 Chateau Margaux foam in a dish, no doubt (or already has!) But with some time for the idea to grow on me, I can more easily see where some of my California red blends, that taste so delicious after decanting, could improve from this technique. I’m still sitting on the fence on this concept. Could I try hyperdecanting with new world wines? Sure, I could give it a try, especially with a $50 or under red blend. Old world, highly collectable (and expensive) wines could benefit even more from hyperdecanting if the concept were not so horrifying and violent to the viscous liquid we hold so dear to our hearts. Am I willing to try it on my ‘prized possession’ vintage bottles? Honestly? No way. Not a chance, right now. I’d love to hear from others as to what you think about this concept. Please share your thoughts, either as a comment to this blog, or in a direct email to me at jvbuncorked@gmail.com. Merci! Something about fine wine invites mystique, ritual — and more than a little pretension. Thus aerated, the wine is then allowed to “breathe” for a while before it is served. Oenophiles — even those back in Roman times — have observed that wine of many vintages and varieties improves perceptibly when aerated for as little as a few minutes or for as long as a day. Oenologists have debated the chemistry that might account for this shift in flavor. Do the tannins change in ways that soften their distinctive flavors? Or does aeration simply allow stinky sulfides enough time to evaporate away? In carefully controlled, double-blind taste tests conducted at our lab, we presented 14 experienced wine tasters — seven sommeliers, three vintners, two oenologists and two wine writers — with unlabeled samples of hyperdecanted wine. The tasters also received samples taken from the same bottles but decanted the old-fashioned way. The order of presentation was varied from one trial to the next. So the next time you uncork a well-muscled syrah — or even a rambunctious riesling — for your connoisseur friends, bring a blender to the table, and have a camera ready. The foam will subside within seconds. But you’ll cherish that memory of the look on their faces for the rest of your days. After a little digging, Google led me to this Bloomberg source from September 22, 2011, that I found interesting, and also lays out a scientific method for blind taste testing with your friends! Although torturing an expensive wine in this way may cause sensitive oenophiles to avert their eyes, it almost invariably improves red wines—particularly younger ones, but even a 1982 Château Margaux. Don’t just take my word for it, try it yourself. But set up a proper blind taste test to avoid subconscious bias among the tasters. That’s a bigger problem than you might imagine. Researchers who examined the voting records of wine judges found that 90 percent of the time they give inconsistent ratings to a particular wine when they judge it on multiple occasions. To avoid bias, use a “triangle test,” which is a scientifically rigorous way to test for a perceptible difference between wine prepared two different ways. Get as many judges as you can—10 is the minimum to get good statistics. Give each judge three identical glasses, and label the glasses X, Y, and Z.
Hyperdecant half a bottle of wine, and save the other half of the bottle to use for comparison. Out of view of the judges, pour an ounce or so of wine into each glass. The undecanted wine should go into two of the glasses, the hyperdecanted wine into the third, or vice versa. Vary the order of presentation among the judges so that not all are tasting the hyperdecanted wine first or last. Record which wine goes into which glass, and have the judges guess which two of their wines are the same. You’ll probably find that hyperdecanting does clearly change the flavor of the wine. To determine with scientific rigor whether your tasters prefer the hyperdecanted wine requires a more complex trial called a “paired preference” test, or “square” test. But a blind side-by-side comparison works passably well, too, and requires no math. And finally, Terrence Jones did a YouTube video on hyperdecanting that I found interesting, his results seem inconclusive at first but land in favor of the use of the blender. I think that this is just another example of the “immediate gratification” segment of our current society. A group that has to have food delivered in a drive up window, would not understand the concept of decanting a bottle of wine, and until they mature and develop a sense of decorum, let us allow them to “hyperdecant” the jug wines that they must be guzzling, because they are in a hurry. I am with you, and I do not have to be in a hurry to enjoy a fine bottle of wine.